Despair to Creativity - and Beyond! - Anglia Counselling Ltd. Despair to Creativity – and Beyond! This post is a wonderful guest piece that explores candidly the journey of just one remarkable individual who demonstrates in a truly inspiration way how it is possible to channel and self-manage serious and other depressive illness – into positivity via the medium of artistic creativity. Since qualifying from Writtle College with a BSc in Landscape and Garden Design, Ian Price has won a number of awards for his gardens including the ALCI (Association of Landscape Contractors of Ireland) Bog Oak Trophy. 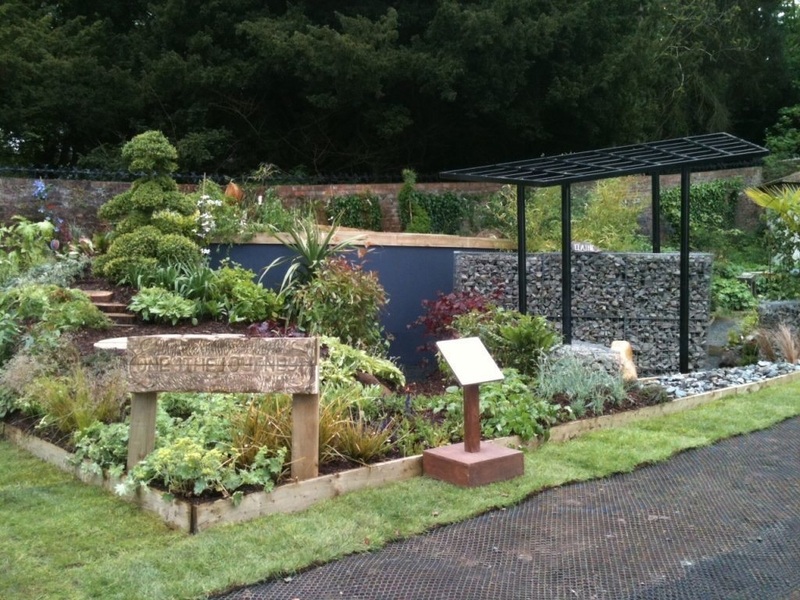 Ian has also received accolades for his Show Gardens in 2004, 2005 and 2011. Further details at the foot of the page. After losing my job, my parents business closing and a death in the family (amongst a few other events in a short space of time), my mood plummeted. I neglected myself completely, tried to hide from the world and became incredibly insular. As I said it came to a head in December 2011, after a long period of losing work due to the illness controlling me and subsequently becoming financially insecure. I was put on medication as the only solution of help by the doctors, and sent for assessment in the local mental health hospital, which got me nowhere. I also tried CBT, but when I felt I was well enough (not when I was well enough) I came off it, as I felt guilty for taking someone else’s place. Self-medicating is never a good idea. I was good for a while, then things started slowly getting worse over the years; relationships fell apart with girlfriend and family and things starts to go really wrong in relation to work. I went back to the doctors, again whose main solution was to medicate again. The medication did help, but it didn’t solve the problems at source. Psychiatric help felt patronising; the best help I got was going to peer support groups. It took me a while to be able to open up at these meetings, but knowing that I wasn’t alone in my suffering and hearing other people with similar experiences was such a boost. What set me off in a bid to end my life was, what I felt at the time, interference; however, it was actually an intervention, and offers of help, from my family. I know that now, but at the time I didn’t take it well. I design and build gardens for a living. To turn the negative into a positive I designed a show garden to tell my story in order to prove to myself that I was capable and worth it. One 4 the Journey… told the story of a sufferer of depression and how it feels along the way. The garden contained a lot of symbolism. There were four main areas, the first of which was buried about 1.2 meters into the ground with a dark pool and surrounded by stone filled Gabon cages. Two paths lead out. The first was a false start, and led back to the beginning again. The second path led out to a curved mirror – it gave a false reflection as you looked at it, and you didn’t see yourself as others do. The path out was over a metal bridge and through a tunnel of bamboos, which brought you out into another choice of paths. One was short and Steep, while the other was longer and more gentle but both led to a circular paved area – the vicious circle. From there the path wound upwards via a set of cut log steps and eventually onto an open relaxed decking area. The shapes of the platforms and the pool were representative of the broken vicious circle that had been rearranged, as if you were in control of it, instead of it in control of you. From this platform the sunlight was reflected from the shallow pool, and you were able to look down and see some parts of the journey that you had made. 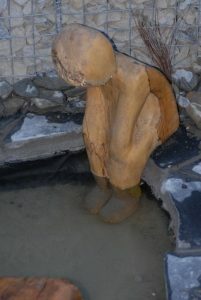 Two out of the first three people, to visit the garden at the garden show, turned to me and said they understood the meaning of the garden completely and needed help as they couldn’t cope as they were as one said “in a dark place”. Hearing their response and getting those people help made it all worthwhile. Like a rubber ball, I needed to hit something, in this case rock bottom, before I could bounce back again. It has taken me time and lots of effort, but I am so much stronger than I have been in many years. What are your experiences of overcoming a depressive or other mental health challenge? Do you want to feature here and share? Please leave your comments on this or other matters and show the world it really is possible to de-stigmatise mental health issues, and feel well whilst raising awareness.